I love traveling. I know everyone says that, but I'm someone who cannot stand the same old same old and needs to get out and explore the world around her. Luckily, Jesse shares my love of traveling and we have a big long bucket list of travel destinations and adventures that we long to tick off. 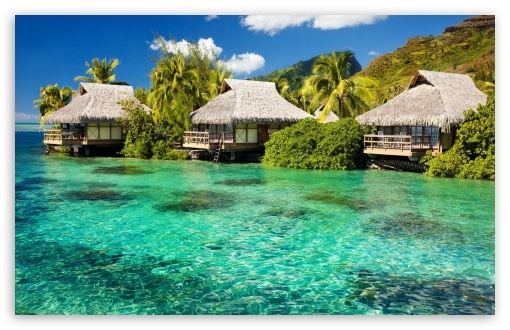 One of the things closest to the top on that bucket list is to stay in an overwater bungalow. Think; Tahiti, The Maldives, Fiji, Bora Bora. The crystal blue waters, the clean white sand, the cool ocean breeze and the sounds of waves rolling in one by one. That is my kind of heaven. Whilst I'm usually someone who is go go go, I could listen to the sound of the ocean for days and do absolutely nothing and be totally okay with that. But what I realised is that I didn't actually know much about my dream vacation at all. I didn't know where the best places were to stay, the best time of year to go, what other activities I could enjoy - and when Jesse asked me how overwater bungalows didn't float away in a storm, I honestly didn't know. I said to him "well I guess they're stuck into the ground like over-water bridges, right?". Jesse is definitely a safety first kind of guy. He needs to know all of the details before he considers something. I learnt this before our Bali Honeymoon - I had to plan a holiday from start to finish and then tell him about it to get his sea of approval. So I got to researching..
First I found out the most important detail; An overwater bungalo will not float away during a storm because they're built on pillars that are sunk well into the ground below - just like an over-water bridge. After I'd finished drooling, I stumbled across Travel Associates' quiz on Overwater Bungalows (and I'm a sucker for quizzes) and learnt quite a lot through my apparent lack of knowledge (the quiz tells you what the right answer is even if you get it wrong). A gorgeous view, the sound of the ocean, the crystal blue waters, relaxation - usually that all comes with a major price tag, but I was shocked to find that there are so many different options at a range of different price points. Whilst I can very happily waste away my day in the sun with a good book and a cold drink, I love exploring too. Most of the overwater bungalows I looked at were in areas that were filled with things to do - snorkeling, shopping, cultural events, hiking and heaps more. I mean, honestly, an overwater bungalow trumps any type of hotel room. There really is nothing like it! But tell me, what kind of vacation/adventure is on the top of your bucket list? And are you a planner when it comes to holidays - or do you like to go with the flow?